Good morning! It's Tuesday and time for another fun Peachy Keen Challenge! You know I love me some sketches, and this sketch is a dandy!! I'm breaking away from my much loved Halloween/Fall stamps and I brought out the Christmas stamps. It'll be here before we know it, and this adorable little Skip character from the PK-334 Lauri Loves Skip Faceless Elves stamp set was really wanting to see some ink. He's a good size fella, which is spot on for me as far as coloring goes. I LOVE to color larger images. Skip was stamped with Memento Tuxedo Black Ink, and colored with Copic markers. The patterned paper is from K&Co., and all card stock is from Stampin' Up!. My design team sisters have some awesome cards created for your inspiration, so if you hop over to the Peachy Keen Challenge Blog, you can check them all out. You'll sure be glad you did!! While you're there, you'll also see the amazing work of our talented guest designer, Jessica. The Creative Stamper's Spot is where you'll find all of Jessica's fabulous designs, so be sure and drop by there and leave her some love!! I always really enjoy visiting the blogs of our challenge participants and seeing what they've done with the challenge. I sure hope you can play along with us, so that I can see what wonderful work of art you'll come up with. As always, one lucky winner will receive a fabulous prize, just for playing along. Will it be YOU this time? I REALLY hope so!!!! 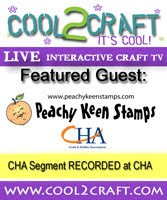 You can find the stamp set I used today, as well as MANY others, including the new Country Bumpkin Stamps, at the Peachy Keen Stamps Store. There's still a GREAT sale on all the newly released stamps, and that will continue through the month of October. Thanks for visiting today! Have a blessed and beautiful day!! Happy Stampin! Lorie, this guy is cute, cute, CUTE! And your card is fabulous!!! Lorie once again you have colored this to perfection! Your shading is impeccable! The buttons and the puffy paint and tools finish it off beautifully! I'm loving Skip!! Who wouldn't want Skip to make a few presents for under the tree?? Love your card. The coloring is fab! Lorie, this took my breath away when I saw it! You're amazing!! Lorie you make the most amazing creations! This little guy is the cutest..you colored him to perfection! I love the way you accented his cheeks with the blush:) Always inspired;) Thank you! Skip is too cute, awesome coloring. Your little one is a cutie. Love all your creations.